To begin with, I warmly thank Kawette, Isabelle (x2), Laurence, Marie-Laure, Michel, Jacques, Jean-Marc, Aymerik (x3), Carine, Karine, Guillaume, Jean Sébastien, Pascal, Carine (x3), Vincent (acceding to the rank of official shareholder! :D), Joël-Alexis, Stéphane, Jean-David, Frédéric, Jean-Ann, Eric, Patrick, Jérôme, Nans, David, Sébastien, Damien, Jean-Chrystophe, Gaëlle (x2), Bénédicte, Pierre-Emmanuel, Patrick, christophe, Matthieu, Isil, Manon, Teddy, Bibi, Pierre, @lexandre, Laurent, José (x2), Cyrille, Jonathan, Catherine, Gauthier, Agnes, Jean-Marc, Alain, Michel, Thomas, Sébastien, Simon, Hélène, Jean Louis, Jérôme, Jonathan, Thibaud, Eric, Laurent, Ralph, Guillaume, Thierry, Jean, John, Olivier, Laurent, Corinne, Jean-Luc, Julien, Ashor Livs, Frédéric, Isabelle, Jonathan, Jonathan, Samuel, David, Laurent, Salim, Vincent, Eric, Hubert, Michael, bruno, Shiraz, Kévin, Norbert, Yann, Fred, Thomas, Sylvain, Cécile, Gary, Martial, Karl, Jean-François, Jorg, Cyrille, Jean-François, Abdallah uneInvitation.com, Stéphane, Jonathan, Pascal, Maxence, Grégory, Erick for their invaluable taking part. To begin with, go to this address, and choose "personal account". Fill in the form and validate after having captured the visual code by respecting the capital letters. You then arrive to the famous bank information. If you cancel at this moment, your account will however be created, but you will not be able to make transactions. If you create an account to make a donation, for example, then capture the required information and validate. Of course all the information transfers are secured. Afterwards, when you will wish to make a purchase action on a website proposing this option, or if you'll wish to make a donation to coucoucircus.org, you will just have to capture the amount (from 1 €, but please note that Paypal always take a commission on the person that receives the donation), your e-mail address and your password, and go! 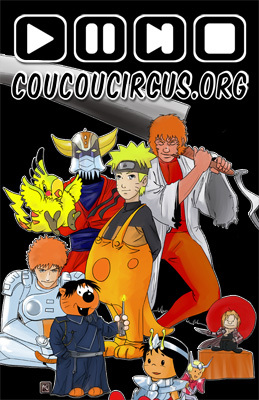 Aside that, there are all the people that are taking part by giving to coucoucircus.org their own sources. Old tape records, vinyl records, brainwaves on the net, in short, all that the website can use and that can complete the collection. I consider this investment as a real contribution, so do not hesitate. Now, regarding the various areas, it is out of a question to put all the titles of an original soundtrack. It's needed to let the net surfer the desire to go and buy the album for him to enjoy it all (it's especially the case for the OST area). Moreover all the information missing in some of the pages will have to be completed in the end, in order to propose other ways of titles classification (by Year, by performer...). I also consider as an active contribution, every mail that allows us to improve the quality of the contents. This way, coucoucircus.org becomes the website of a community made of enthusiasts and each motivated member can add his contribution to the building.